The adenylate kinase enzyme is crucial to managing the energy budget of cells, accelerating the biochemical process whereby energy is stored or released. The enzyme continuously changes between open and closed states. In its closed form, adenylate kinase is particularly active biochemically and thus able to accelerate the chemical reaction of "docked" molecules that it has encased like a clam. These are called ligands. 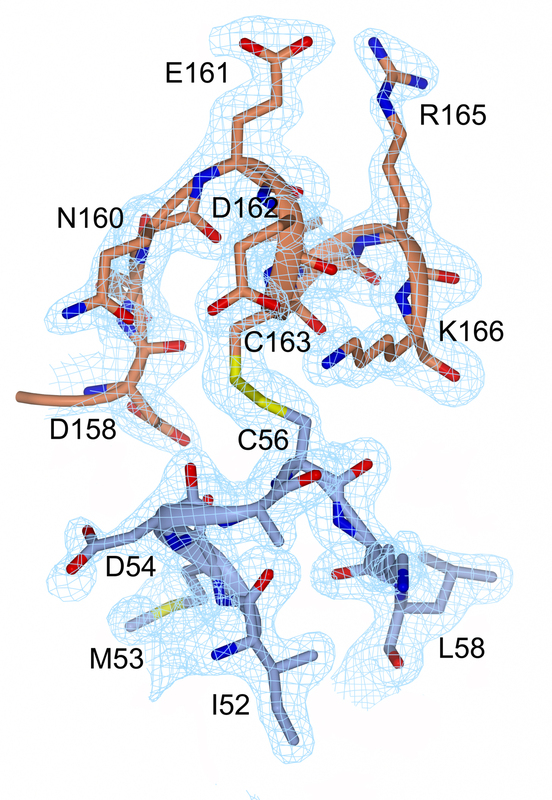 Researchers at the Universities of Konstanz (Germany) and Umea (Sweden) have managed to generate a structural model of the atomic make-up of the enzyme in its closed state, including an embedded ligand. Using nuclear magnetic resonance (NMR) spectroscopy and X-ray crystallography, structural information about the enzyme in its closed state was won - information, that is, about the precise moment that the enzyme is biochemically particularly active. A particular trick was necessary to facilitate the structural analysis of the enzyme's closed state in the first place. The research findings, which provide important information about the biochemical mechanisms that govern the energy budgets of cells, were published in the journal Proceedings of the National Academy of Sciences (PNAS). The adenylate kinase enzyme opens and closes like a clam: it opens to receive a ligand and closes in order to "process" it biochemically. Afterwards, it opens once again to release it and admit the next ligand. This happens 340 times per second - much too fast to map the individual stages of the process via structural analysis. For structural biologists, gaining information about the closed state of the enzyme at the precise point in the process where biochemical activity peaks is of immense value. Professor Michael Kovermann, junior professor of magnetic resonance spectroscopy at the University of Konstanz, found a way to make this possible. He introduced a disulphide bond as a "chemical thread" of sorts in order to force the enzyme to take on its closed form and trap it in this state. The enzyme remains in exactly this position, allowing the researchers to analyse it using NMR spectroscopy and X-ray crystallography. Kovermann was able for the very first time to generate images of the precise moment that the enzyme processes the ligand biochemically. Two years earlier, he had already managed to take structural images of the enzyme in its open state and with the ligand already in place. "The beauty of it is that, now, we are able to image both liminal states and to make the structural data publicly available", Kovermann says. His trick of trapping the enzyme in its closed state can now be used in further inquiries. The state of the enzyme can be controlled by linking or removing the disulphide bond. Kovermann's analyses had already shown that the enzyme's affinity for reaction - the chemical pull between the enzyme and its ligand - increases many times over in its closed state, whereas its productive turnover decreases at the same rate. In other words: Chemical activity between ligand and enzyme is particularly high during the closed state. But turnover decreases because the ligand cannot escape the closed "clamshell", which means fewer ligands in total pass through the enzyme. Kovermann was also able to prove that adenylate kinase's structural dynamic strongly depends upon the interaction between enzyme and ligand- i.e. upon the presence or absence of a ligand. To do so, he compared the enzyme's closed state for both variations, with and without a trapped ligand. If there is no ligand, the closed enzyme's dynamic remains unchanged as compared to its open state. However, once a ligand is present, marked changes can be observed. "This behaviour is counter-intuitive, it's not what one would expect", explains Michael Kovermann. "It is only thanks to NMR spectroscopy that we were able to document this surprising result". "Structural basis for ligand binding to an enzyme by a conformational selection pathway". M. Kovermann, C. Grundstroem, E.A. Sauer-Eriksson, U.H. Sauer, M. Wolf-Watz, Proceedings of the National Academy of Sciences 114(24):6298-6303, 2017. - The research conducted by Junior Professor Michael Kovermann at the University of Konstanz is funded by the Baden-Wuerttemberg Foundation, the Collaborative Research Centre CRC 969 "Chemical and Biological Principles of Cellular Proteostasis" as well as the Konstanz Research School Chemical Biology (KoRS-CB). - Prior publication: "Structural basis for catalytically restrictive dynamics of a high-energy enzyme state". M. Kovermann, J. Aden, C. Grundstroem, E.A. Sauer-Eriksson, U.H. Sauer, M. Wolf-Watz M. Nature Communications, 6:7644, 2015. DOI: 10.1038/ncomms8644. Caption: Representation of electron density at the disulphide bond (yellow, between C56 and C163) and in its close vicinity.